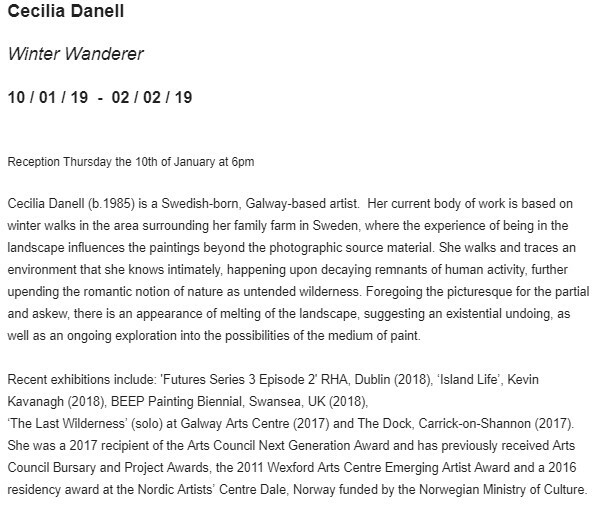 I’m thrilled to announce that I’ve been awarded a 2 month residency at the Centre Culturel Irlandais in Paris and The Visual Artists Ireland Suki Tea Art Prize which funds the residency. I can’t wait to live and work in the centre of Paris and view lots of art. Thank you to Centre Culturel Irlandais, Suki Tea and Visual Artists Ireland for the opportunity! 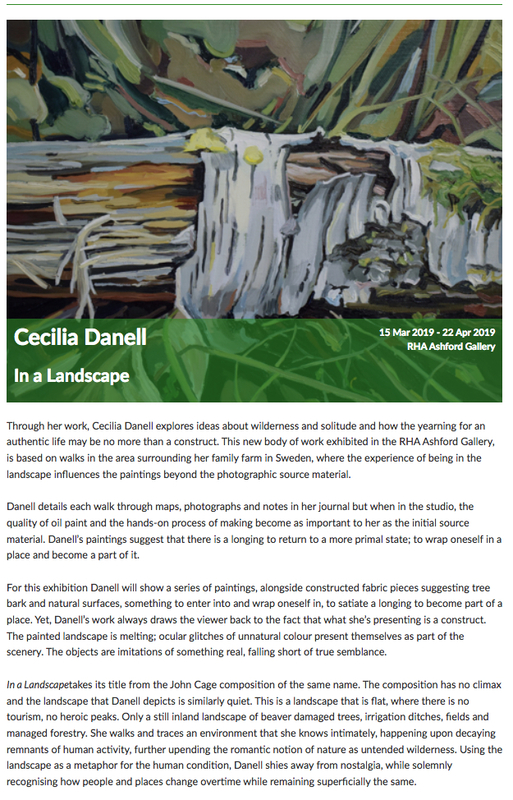 “Visual Artists Ireland and Suki Tea are delighted to announce Cecilia Danell as the winner of this years Suki Tea Art Prize. I’m also very happy to have been awarded a 2019 Bursary from the Irish Arts Council which will fund my work for the coming year. I look forward to getting stuck into new work and research after a busy few months of exhibitions and am very grateful for the support! 14th March: Opening Reception 6-8pm. 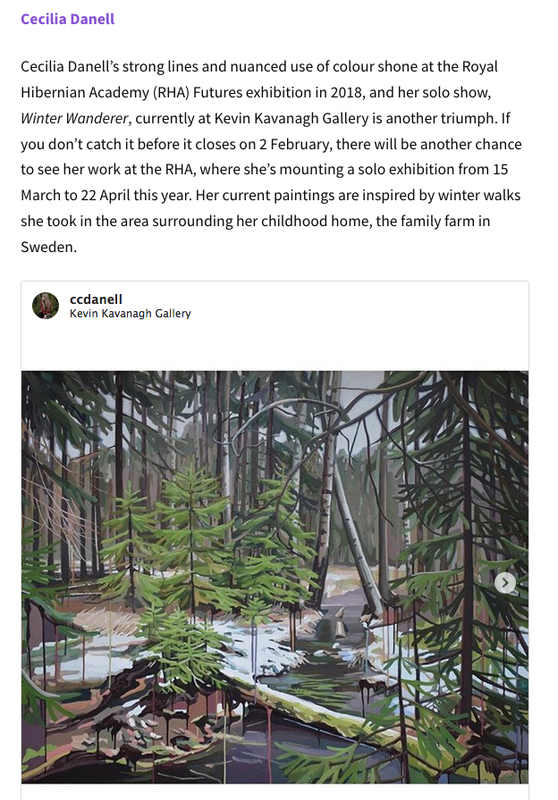 I’m delighted to have been named by critic Cristin Leach as one of eight artists to watch in 2019. 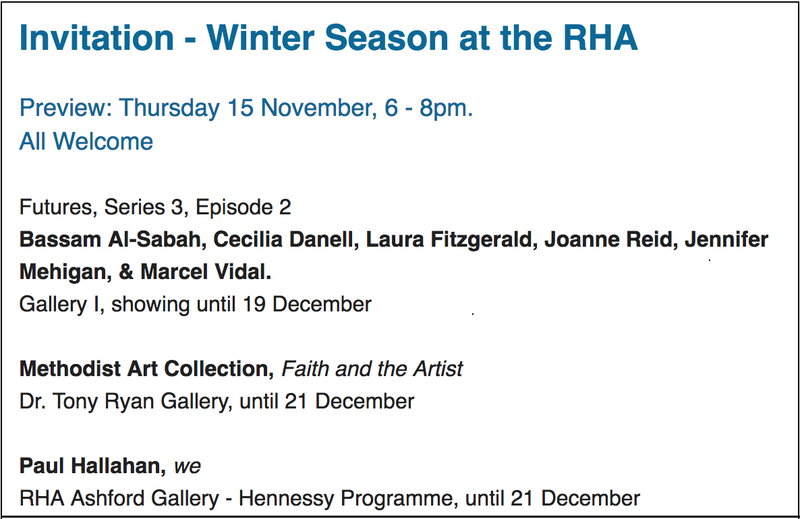 A conversation with some of the artists will be held on Thursday the 25th October at 5.30pm. 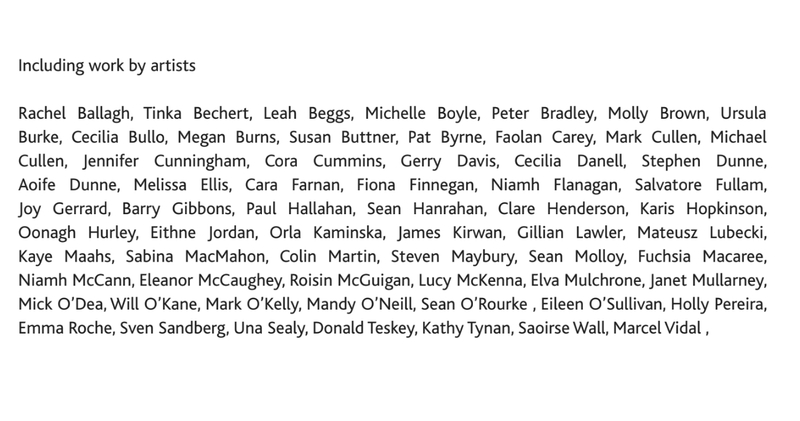 Sonia Shiel, Nevan Lahart, Sinéad Ní Mhaonaigh, Kathy Tynan, Aileen Murphy, Marcel Vidal, Stephanie Deady, Stephen Loughman, Lesley-Ann O’Connell, Cecilia Danell, William O’Neill, Pat Byrne, Salvatore of Lucan, Robert Armstrong, Mark Swords, Dermot Seymour, Julia Dubsky and Joe Scullion. Island Life will have it’s second outing later this month in Custom House Studios Gallery, Westport. 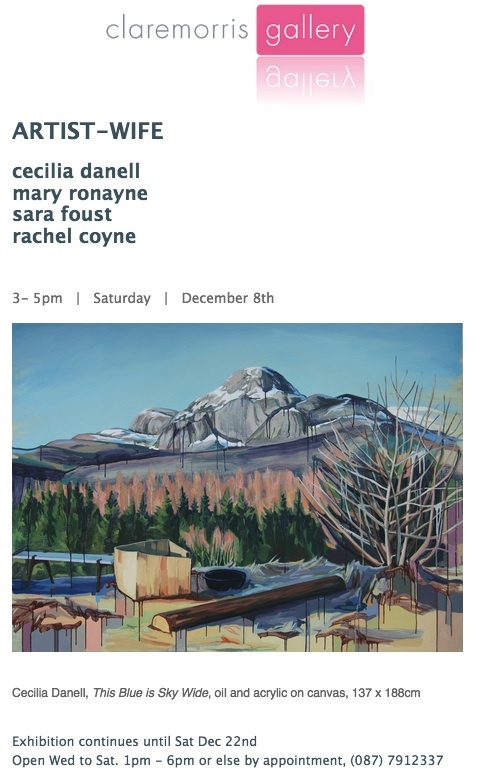 The exhibition will include some new works by previously exhibited artists as well as the addition of Nevan Lahart, Aileen Murphy, Dermot Seymour, and Sinéad Ní Mhaonaigh. 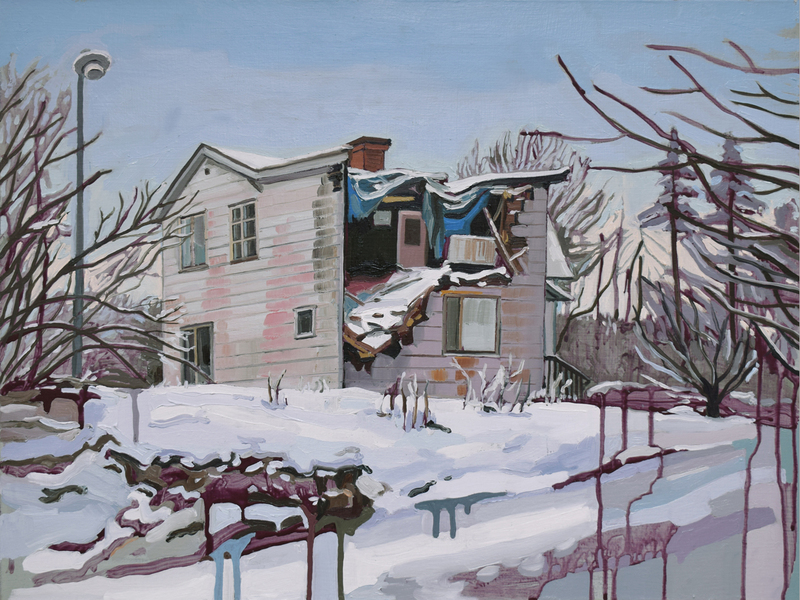 Painting exists in an increasingly sophisticated visual world that sometimes seems to have a diminishing interest in the possibilities of paint. Island Life is concerned with the idea that, within the medium of paint there are opportunities for the individual to question the situation we live in and the resources we share. The paintings in this exhibition address the human condition and each of the artists suggests the capacity of the medium of paint to encompass both personal and universal concerns. I’m delighted to have been selected to exhibit in the 2018 Beep Painting Prize exhibition at Swansea College of Art, Wales. Part of the city-wide Beep painting Biennial. Judges for this year’s prize show were Andrew Stitt and Sue Williams. Launched in 2012, beep (biennial exhibition of painting) is a contemporary painting prize drawing artists from all over the world. Beep supports imaginative and vibrant practice in contemporary painting & returns with an expanded programme of satellite painting led exhibitions, residencies and symposiums around the main prize show in partnership with Swansea galleries and educational organisations. 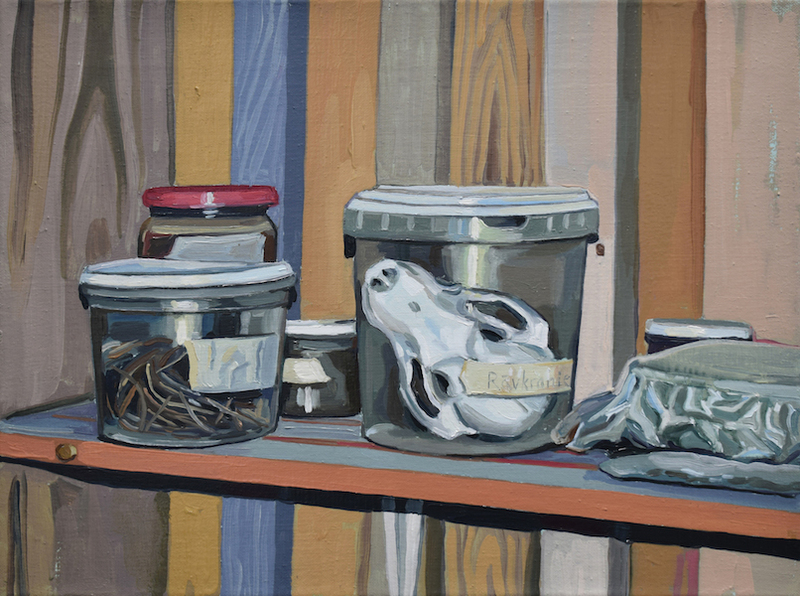 Island Life comprises work by artists who are making and showing paintings at the moment. It is intended as a celebration of where painting is at now in Ireland, with a mixture of emerging and more established artists. I was interviewed by Alison at AMW Visual last summer about art, music and the importance of creativity. The interview premiered on West of Ireland cultural site An Áit Eile yesterday. 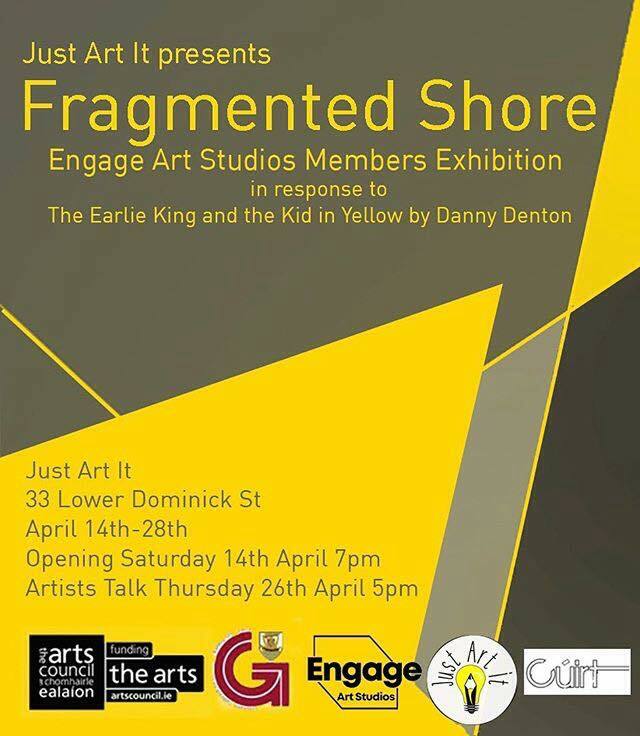 Galway Arts Centre is delighted to present works by artists from Engage Art Studios Galway. The exhibition is a snapshot of current studio practices, research themes and experiments in medium by 15 of the 25 members of the studios, located in Middle St and Francis St in Galway City. 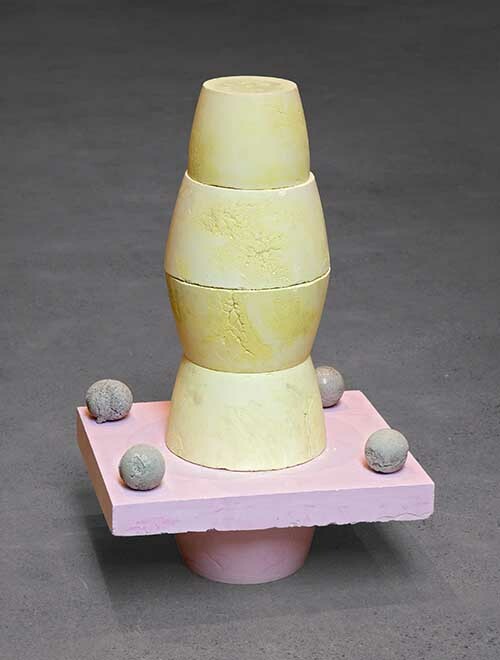 While each artist has an individual practice and set of processes, they are interested in the nature of creating artworks in an age of mass image-based media where often time the image that represents an event, person or place becomes its own entity with its own truth and value, separate from reality and original source. 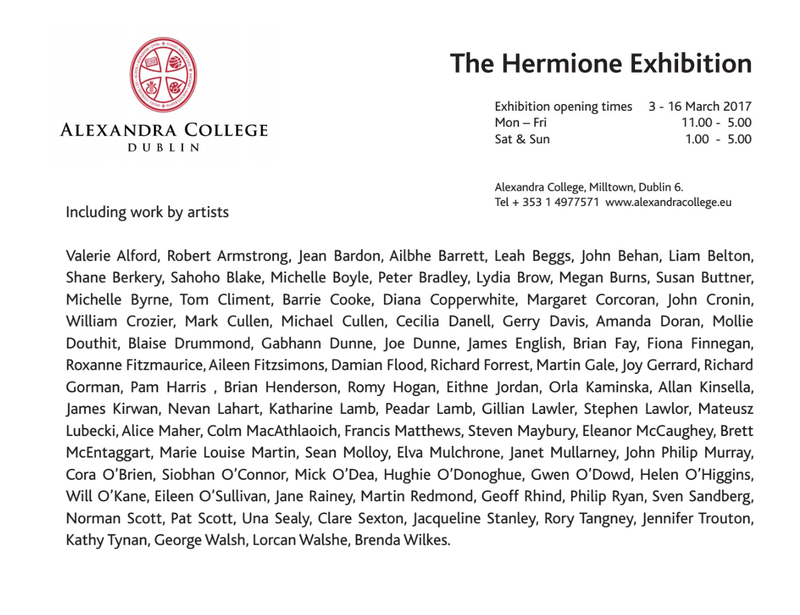 I’m delighted to have been invited to show work in the annual Hermione Exhibition at Alexandra College, Dublin for the third year in a row. 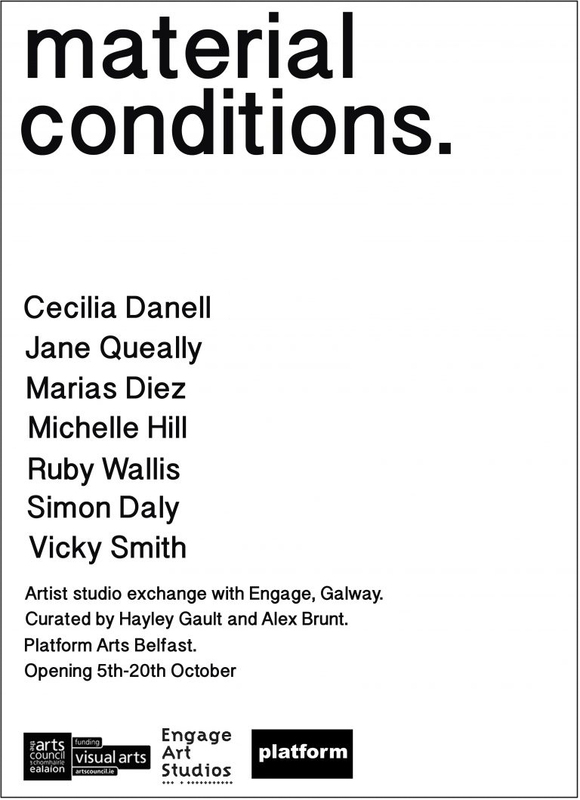 It is curated by Aisling Prior and the line-up is great, so go and see it if in Dublin! I’m showing two paintings, one of them being the brand new: ‘On Falling’ – Oil and acrylics on canvas, 45×60 cm, 2018. 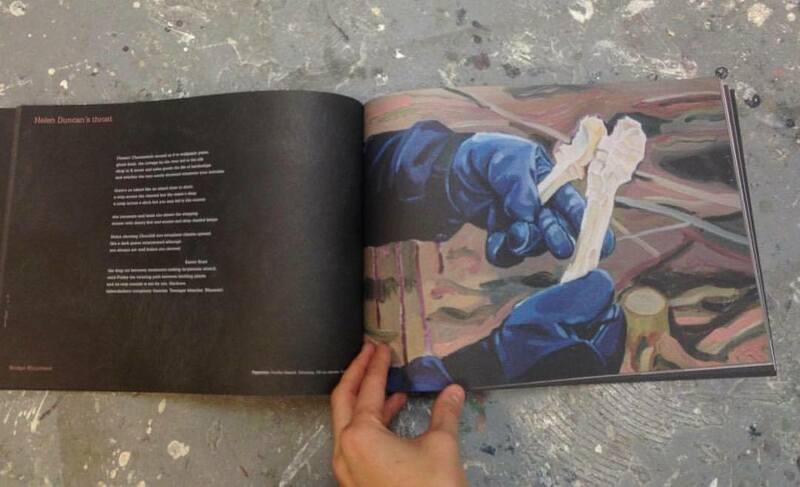 I have a painting featured in the current issue of Abridged Poetry/Art Journal 0-51 Wormwood. Abridged is based in Derry, Northern Ireland and the issue was launched at the Golden Thread Gallery, Belfast on the 2nd November. 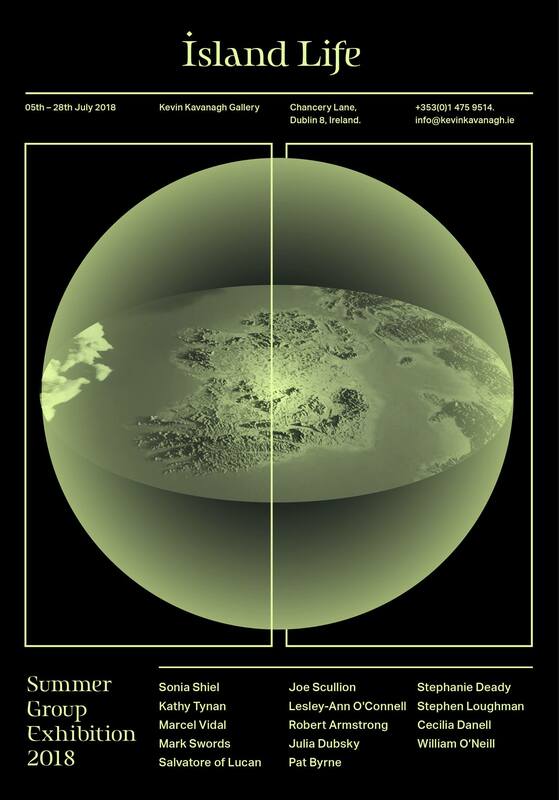 You can read it online :here: or pick up a copy for free in select art venue on the island of Ireland. 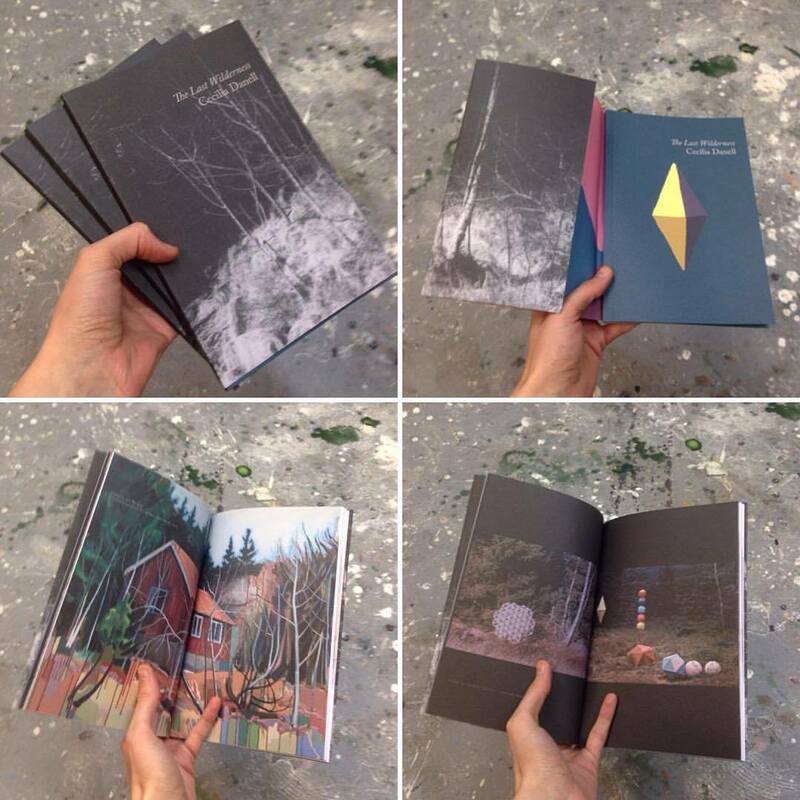 I am also delighted to have my recent publication ‘The Last Wilderness’ selected for the Dublin Art Book Fair by gallerist Oonagh Young. The Dublin Art Book Fair runs at Temple Bar Gallery & Studios during Dublin Gallery Weekend 23rd-26th November with a launch at 6pm on the 23rd. My publication is also available to buy on the :contact: page of this website. I am delighted to announce that I am one of the recipients of the Arts Council Next Generation Bursary Award 2017/18. The purpose of the Next Generation bursary award is to support a group of promising artists across all disciplines at an early but pivotal stage in their career. Recipients will receive €15,000 and will also take part in a collective week-long residential programme at The Tyrone Guthrie Centre in spring 2018. I look forward to developing my practice over the next year and am very grateful for the support. Opening Reception Thursday 5th October 6-9pm. Exhibition running until the 20th October. I was invited by curator Paul McKenna of the McKenna Gallery in Omagh, NI to show a piece in ‘Facing West’, the main exhibition at Boyle Arts Festival. 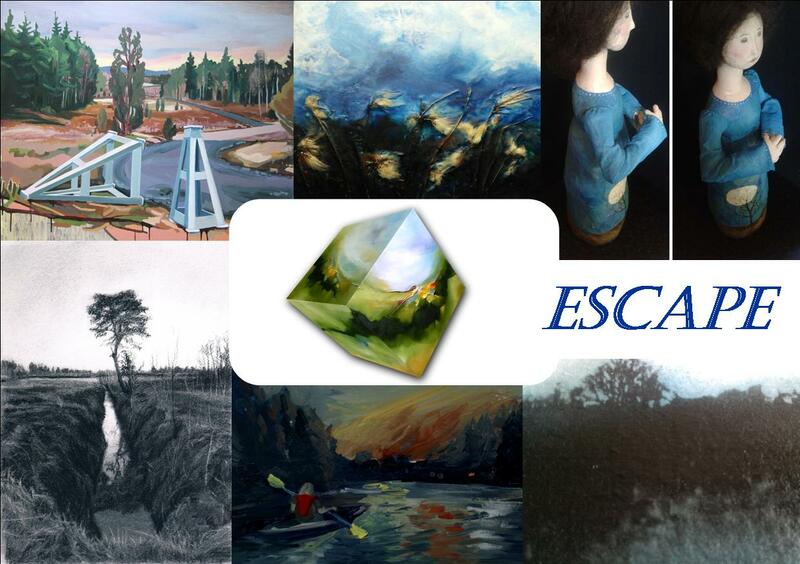 Over 100 established and emerging artists are featured in the exhibition, including John Behan, Brian Bourke, Bernadette Kiely, Mick O’Dea, Hughie O’Donoghue, Ann Quinn, Dermot Seymour, John Shinnors, Micky Donnelly, Eilis O’Connell and Amelia Stein. The Exhibition was opened on the 20th July by Minister for Culture Heather Humphries and is running at King House, Boyle, Co Roscommon, until the 18th August. 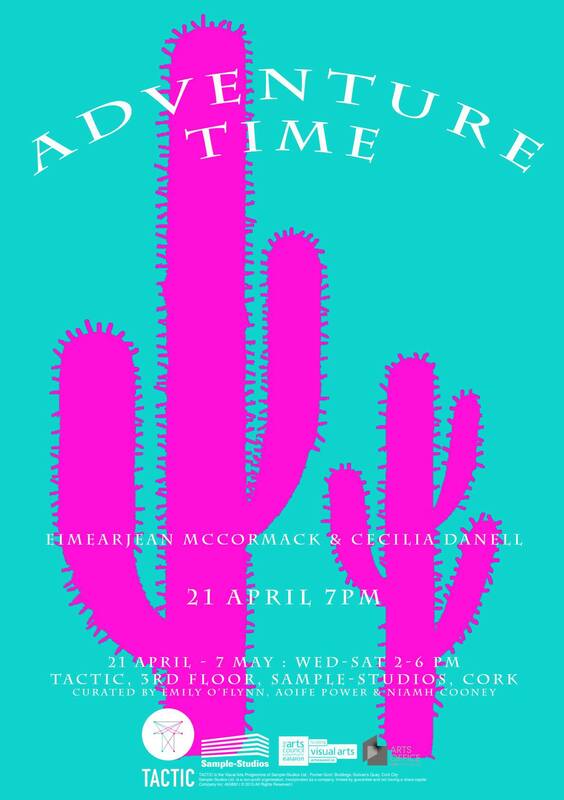 A video where I talk about my current exhibition at The Dock, Carrick-on-Shannon, Ireland. 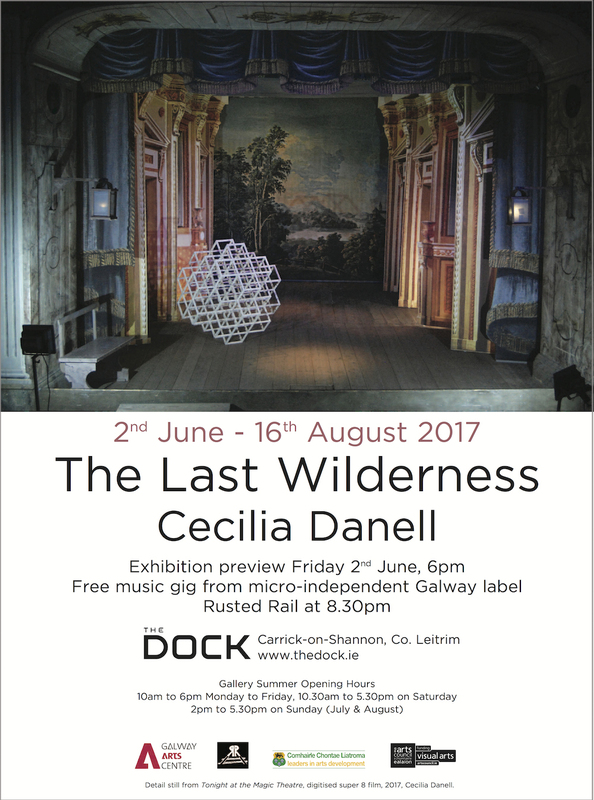 Cecilia Danell, The Last Wilderness, at The Dock from THE DOCK ARTS CENTRE on Vimeo. Opening Reception 2nd June at 6pm followed by a free gig in the Dock theatre space featuring Rusted Rail label acts A Lilac Decline (Cecilia Danell), Phantom Dog Beneath the Moon and Loner Deluxe. A Lilac Decline will be joined on the night by Sofia Ek who’s coming over from Sweden. She made the soundtrack for and assisted on the shoot of the film ‘Tonight at the Magic Theatre’ which features in the exhibition. 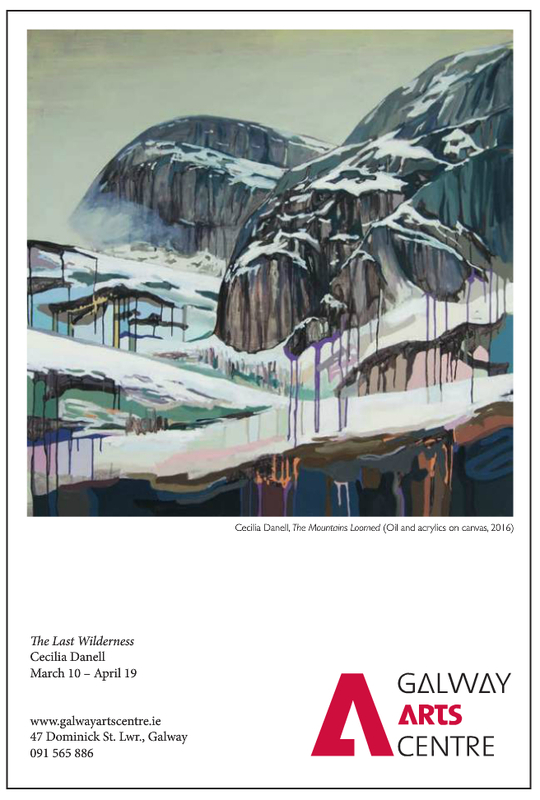 I’m delighted with the feedback I’ve been getting on my exhibition ‘The Last Wilderness’ which is showing in Galway Arts Centre until the 20th of April. It’s my most ambitious work to date and was made possible through an Arts Council project award and through working with several different people. The ones that I’d like to give a special mention are Sue Rainsford who wrote the beautiful essay ‘and the trees, too, were melting’ for the publication on my work that was launched on the night of the opening and who also opened the exhibition. Sofia Ek, who made the soundtrack for my film ‘Tonight at the Magic Theatre’ and who was also my assistant on the film shoots in Sweden. Noel Arrigan and Gabriel Henry who made the photo lightboxes for me, which turned out to involve a lot more work than first anticipated. 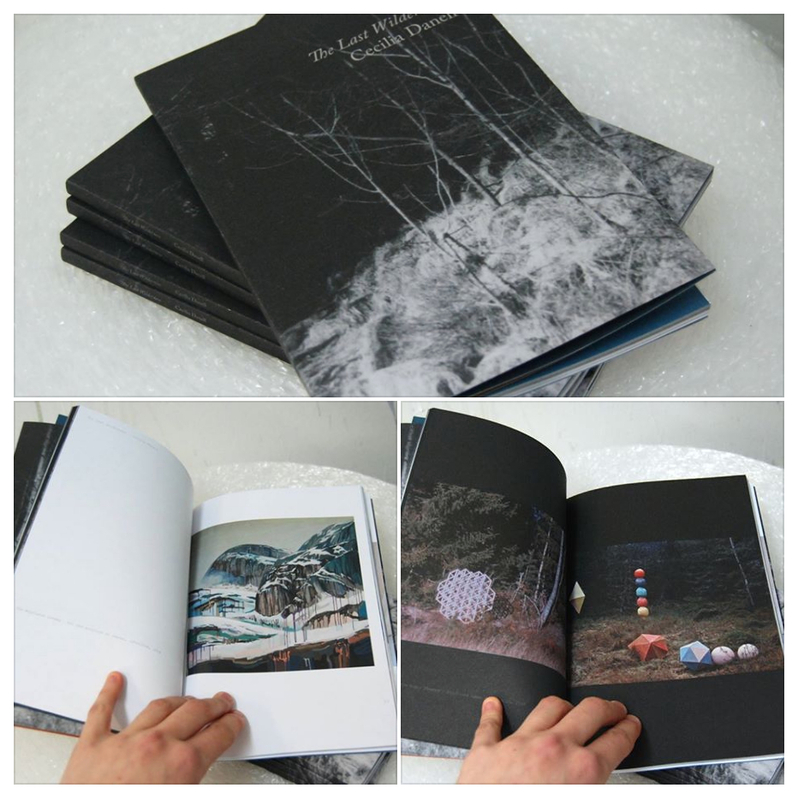 Padraig Cunningham at Pure Designs who designed the publication, it’s really beautiful. Eoghain Wynne, the Galway Arts Centre technician who worked tirelessly with me on the time consuming install and of course Maeve Mulrennan, head of Visual Arts at Galway Arts Centre. 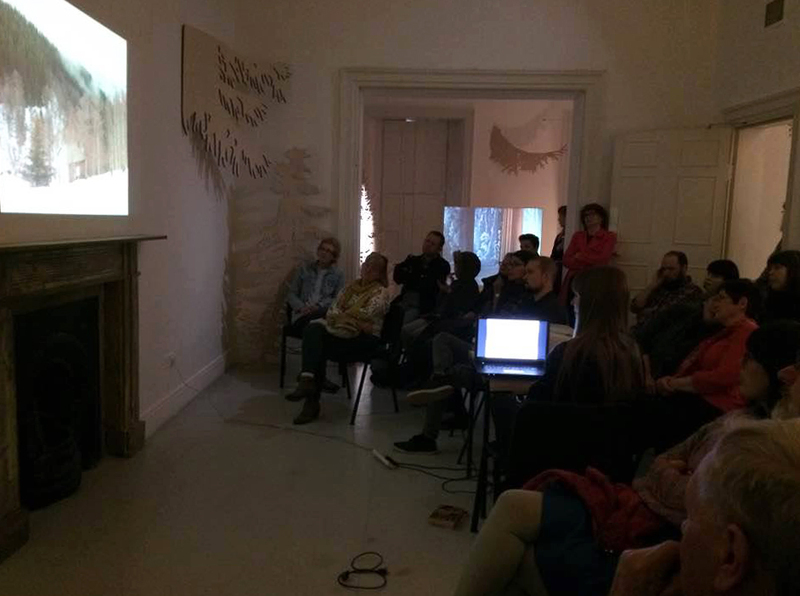 I gave an artist talk last Saturday the 25th March which was very well attended, which I’m also delighted about. I showed images and talked about my Norway residency, the film shoots in Sweden and the overall process of making this body of work. 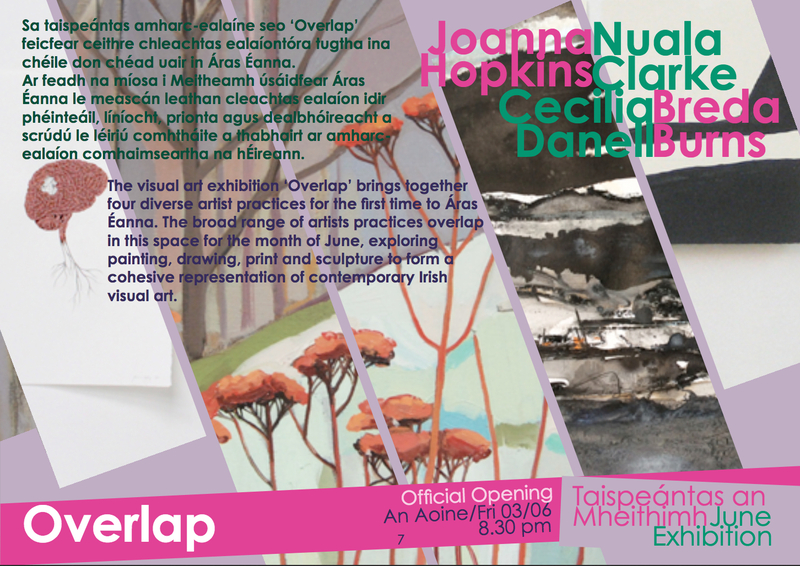 You are all very welcome to the opening of my solo exhibition at the Galway Arts Centre at 6pm on the 10th March. 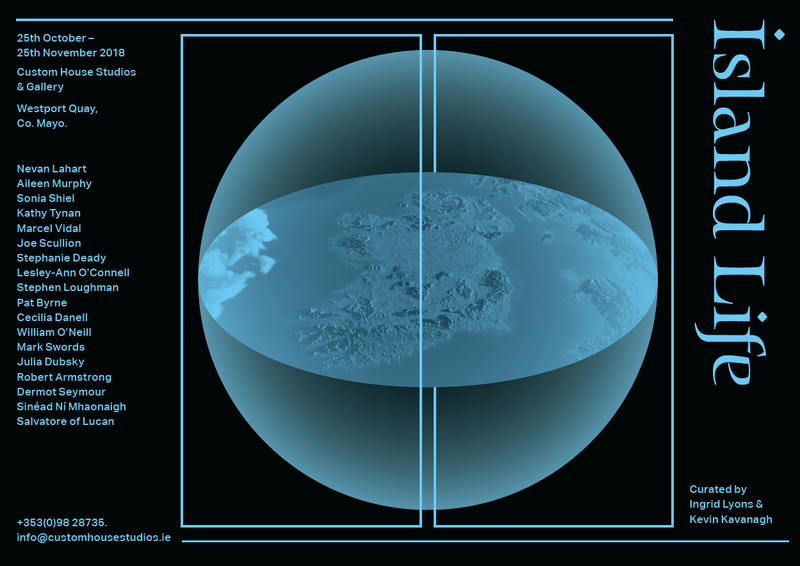 “The starting point for this body of work was a residency at the Nordic Artists’ Centre Dale, Norway in early 2016 and Danell’s proposition: “In a post-nature future, the human mind will be the last wilderness”. Influenced by Jungian psychology, existentialism and Utopian/Dystopian science fiction, Danell’s work uses landscape as a metaphor for the exploration of the human psyche. 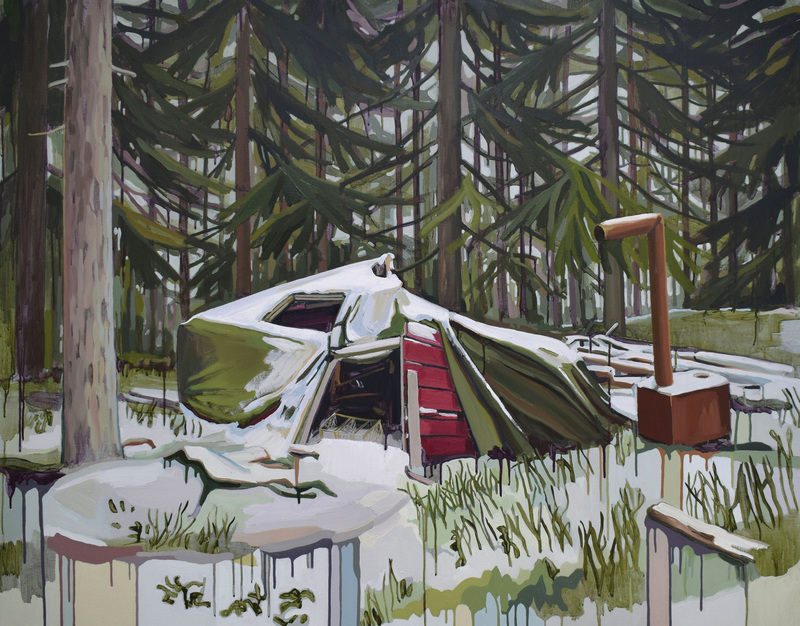 By experiencing and documenting the Scandinavian landscape on foot she explores ideas about wilderness and solitude and how the yearning for an authentic life may be no more than a construct. She has previously used the theatre as metaphor for constructed reality by presenting objects with the surreal quality of being made in the likeness of something, yet falling short of true semblance. Here she has expanded on this further by shooting a film in a Swedish provincial theatre and moving the theatre props out into the landscape. Theatre sets are further referenced in the gallery space through a large-scale forest installation which compliments the film piece. 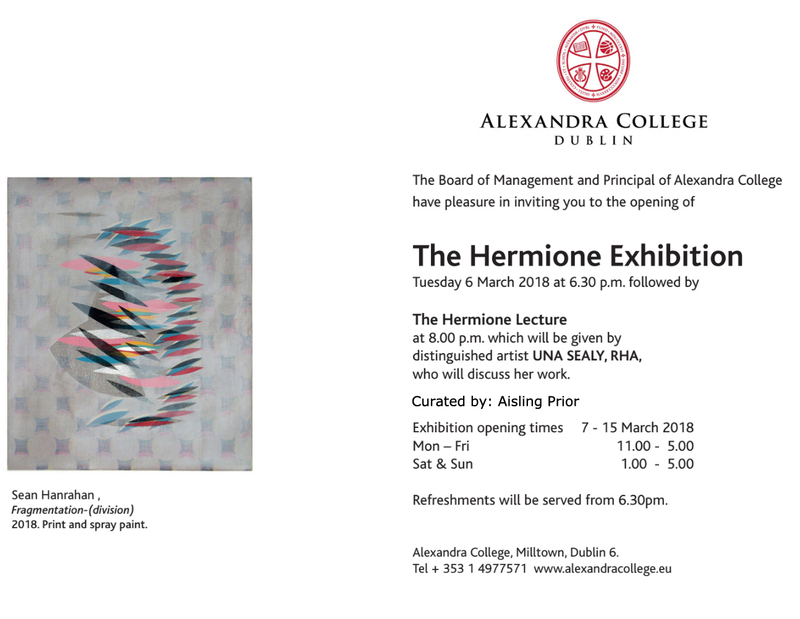 I am happy to have been invited again this year to show work in the annual Hermione Exhibition at Alexandra College, Dublin, curated by Aisling Prior. Below is a list of all of this year’s participating artists. 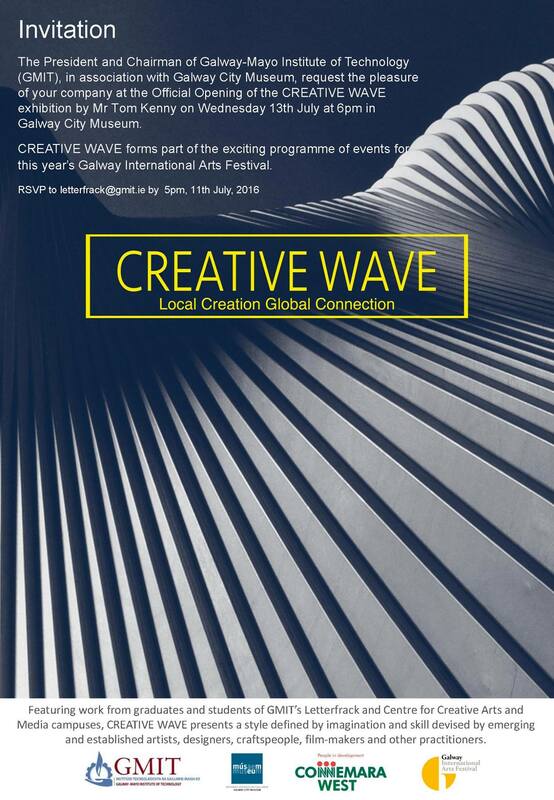 I am participating in the exhibition ‘Creative Wave’ at Galway City Museum for Galway International Arts Festival. The exhibition is curated by Austin Ivers and features students, graduates and staff from the GMIT Centre for Creative arts & Media and Letterfrack furniture college. 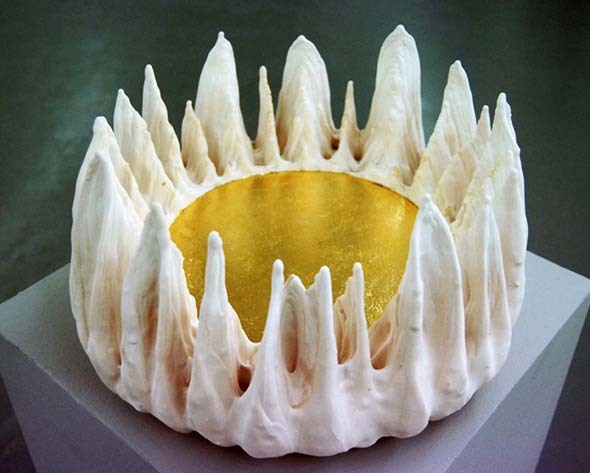 ‘Creative Wave’ also features work by Blaise Drummond, EimearJean McCormack and Louise Manifold amongst others. I am delighted to have been asked by curators Peter Prendergast and Davey Moor to participate in ‘Veins’ at The Molesworth Gallery, Dublin. 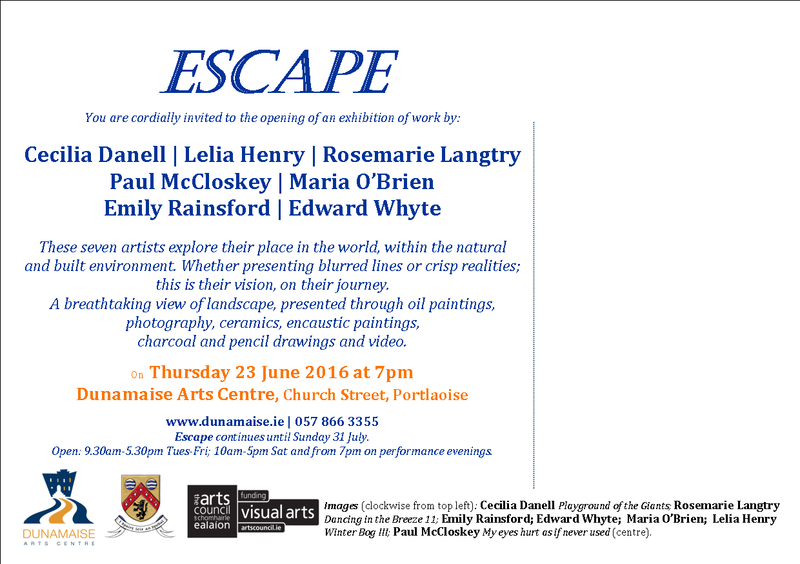 The Opening takes place at 5.30pm on Thursday the 7th July and the exhibition runs until the 10th August. Inis Oirr is one of the three Aran Islands located off the west coast of Ireland. 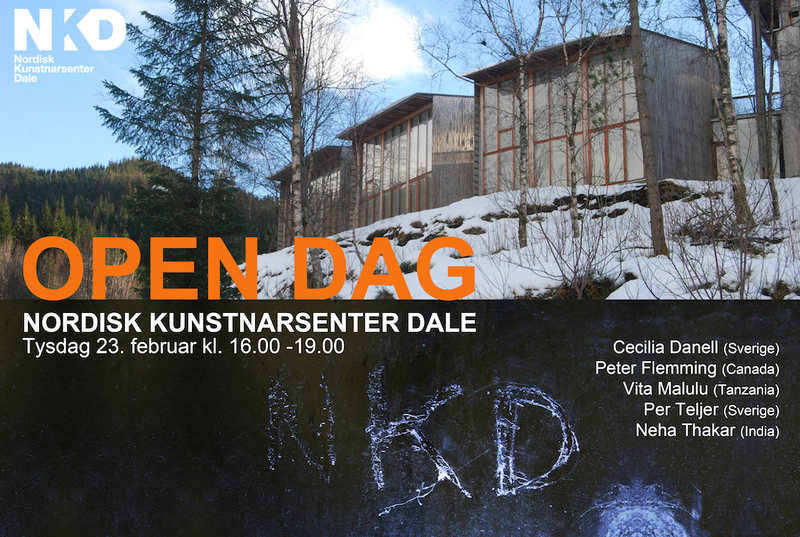 I am currently one of five artists in residence at the Nordic Artists’ Centre Dale. The centre is located in a small fjord community in western Norway. I have spent 3 weeks here, and am really liking it so far. I will be here for two months, until the 31st March. We are having an Open Day on Tuesday the 23rd February from 4pm-7pm. Each artist is given a generous, identical studio space with panorama windows and there’s a wood workshop with a technician on hand each Monday/Tuesday. The centre is currently accepting applications for their 2017 open call, so go on their website for more info. My painting ‘There are no Dark Waters Anymore / Det finns inga mörka vatten mer’ (oil and acrylics on canvas, 107×107 cm, 2013) has been selected for the annual juried autumn exhibition at Edsvik Konsthall, Sollentuna, Stockholm, Sweden. 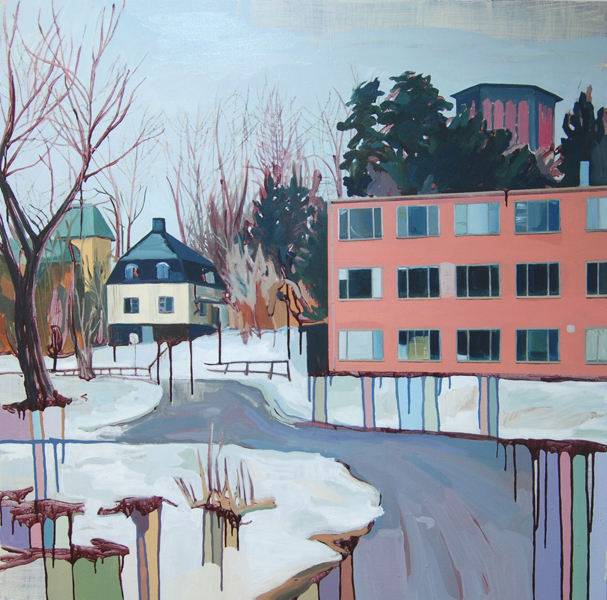 150 artworks out of 1000 submitted were selected for this year’s annual exhibition which runs from the 24th October – 15th November at Edsvik Konsthall.